Home > Introducing Bacteria > Where Do Bacteria Live? Bacteria are one of the most abundant organisms on the planet and there is some evidence that some of them may have even existed on Mars in the distant past. These tiny single-celled organisms are able to survive in many different habitats from deep under the sea to the Arctic, to warm water vents near volcanoes. 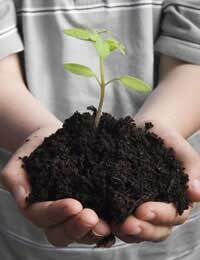 The soil on many parts of the Earth's surface are teeming with them, as are the surface of plants, animals and humans. Bacteria also grow very well inside the digestive system of animals and there are millions of them in the human intestine. Some of the strangest environments that support bacterial life include places that have extremes of temperature. The bacteria found here are also strange, much different to the bacteria found living in and around people. Most bacteria use carbon-based sugars as their substrates, whether they are aerobic bacteria that require oxygen, or anaerobic bacteria that can live without oxygen. Species of bacteria that live in the Arctic permafrost have completely different metabolic systems and use methane as their main energy source. Those that live in deep-sea vents, where no light is able to penetrate, use hydrogen sulphide. There can be as many as three million bacteria in a gram of soil. Bacteria play a very useful role in soil, where they act as decomposers that recycle the organic matter from dead plants and animals. Many different types of bacteria manage the way that nitrogen, the major element present in proteins, recycles in the environment. Some soil bacteria are able to fix nitrogen from the air, converting it to compounds that can be used by plants growing in the same soil. Others work on the decaying proteins from dead matter, converting it into nitrates that can be reused directly by nearby plants. Yet others carry out the opposite process, converting nitrogen-containing compounds from decaying plants and animals into nitrogen gas, which then re-enters the air. This recycling activity is vital in all habitats and is described as the nitrogen cycle. Some nitrogen fixing bacteria actually live in the roots of plants, fixing nitrogen from the air and incorporating it into nitrogen compounds that can be used to build proteins for plant growth. Species that are part of the Rhizobium genus live in root nodules in plants such as peas and beans, which are known as legumes. The bacteria in the root nodules give the legumes the capacity to make large amounts of protein – which is why peas and beans are such a protein-rich food source. The skin of animals and humans teems with living bacteria of many different species. Many of these do good work, crowding out and fighting off bacteria that cause disease. For this reason, they are often called friendly bacteria. All of the body openings also contain large populations of bacteria, particularly the mouth. These are good for the host but animal bites, even if they cause small puncture wounds, can be very dangerous because of all the bacteria that are introduced into the tissues of the animal or person who has been bitten. The digestive system of animals is also a common place to find bacteria. Different animals have different types of bacteria – those present in a ruminant animal such as a cow secrete enzymes that are able to digest cellulose. This interaction enables the cow to digest large amounts of grass in the different chambers of its stomach. In humans and other mammals, bacteria living in the gut help with digestion and synthesis useful compounds that cannot be made by the body systems. For example, humans are unable to make the vital vitamin B12; but it is synthesised in the intestines by specialised bacterial species that exist there as helpful gut bacteria. Bacteria are all around us, which means that we do have to take care, even though most of them are harmless. Pathogenic bacteria can pass from person to person, and they can also survive in our homes and in the environment. Many bacterial diseases spread via food and water. Devastating epidemics of cholera were common in England in the 19th century, caused by sewage contamination of drinking water. Such epidemics still occur in developing countries, or in places that suffer a natural disaster such as a heavy flood or a hurricane. People who are infected with bacteria that cause food poisoning can also pass their infection on when they prepare food for others, making it sensible to take simple food hygiene precautions.